As a mother, there is a quote by Maria Shriver that has always resonated with me… It goes: “having kids — the responsibility of rearing good, kind, ethical, responsible human beings — is the biggest job anyone can embark on.” You oftentimes can feel overwhelmed as a mother and in your career and trying to juggle it all and this simple quote just always resonated with me that the end goal is to raise just kind, ethical human beings that know they are loved. I had the pleasure of interviewingAlison Elworthy. Alison is the Senior VP of Customer Success at HubSpot, where she is responsible for the vision and execution of customer service and support of HubSpot’s global customer base. Prior to her role as SVP, Alison led various functions at HubSpot as Marketing Operations Manager, Sales Operations Senior Manager, Director of Operations, and VP of Operations and Chief of Staff. Alison serves on the advisory board for the non-profit WEST. Outside of work, she enjoys spending time with her husband and two kids and is a food and wine enthusiast. She holds a BS in Human Factors Engineering from Tufts University and an MBA from the Tuck School of Business at Dartmouth. I started with HubSpot in 2010 as an intern while getting my MBA from the Tuck School of Business at Dartmouth and was unsure what I really wanted to do with my career and unsure what a career for a woman in tech could look like. But, I knew that I was driven to keep learning. I have done just that at HubSpot and have moved my way left, right, up and down throughout the organization. I recently moved to another new position within HubSpot — as SVP of Customer Success — and have little ones at home that keep me busy in the best way possible. I have two kids, a boy (4) and a girl (1). 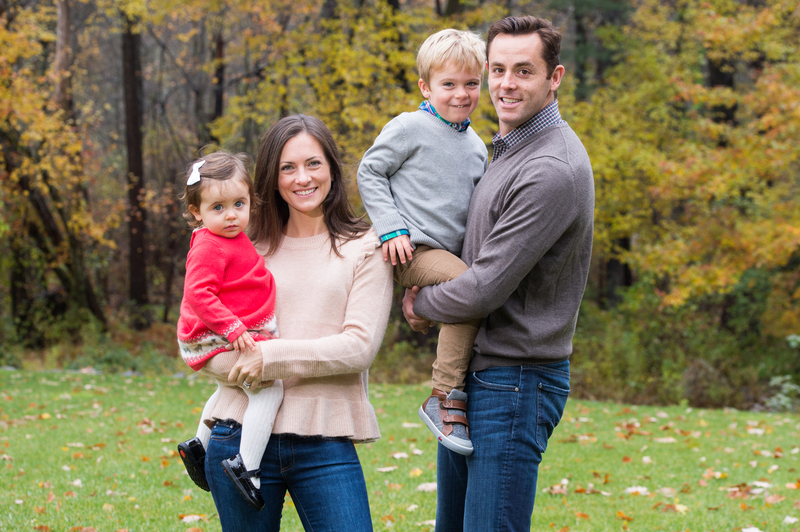 I joined HubSpot in 2010 and four years later I got pregnant with my first child, which truthfully wasn’t the perfect time I had in my mind to start our family. I had just taken on a new role as VP of Operations and ended up ringing the NYSE bell when we went public at six-months pregnant. Yes, I’ve always had the desire to have a family and to experience the instant connection and type of love only a parent feels. I also grew up with a close knit family and family has always been important to me, so I always wanted to have one of my own. I’m a planner through and through. Nothing makes me happier than deadlines, road maps, and spreadsheets. So naturally, I had the perfect time in my mind of when I wanted to deliver my first child. Then I went into labor 7 weeks early and that plan went out the window. I learned very quickly that you can’t prepare for everything when it comes to parenting. You can’t choose the perfect time to get pregnant, to deliver, to have a second, or a third. You just have to accept the experiences as they come and learn to adjust and adapt the best you can. My husband and I try to workout before the kids get up (on a good day), and then we go through our typical morning routine of breakfast, getting dressed and ready for school and drop offs. I usually work from home one day a week to save myself the time of commuting and putting that towards answering emails or seeing my kids in the afternoon. If I do head to the office, I get home around 6/6:30PM and am completely unplugged from work until 8:30PM when they are both in bed. I then usually hop back online to finish up emails, or take a few calls with our APAC offices. When I think back to the big moments in my career at HubSpot, they have coincided with my journey as a mother, which I think says something about my ability to jump into new experiences and roles with a similar mentality of challenging myself and flexing a new skill set. When I found out I was pregnant with my first child, I had just changed jobs from sales operations to global operations, rang the opening bell at the NYSE at six months pregnant, and when I returned from maternity leave with my second child, I took on a team of 700 in a new area of the organization. I will always remember what Sheryl Sandberg said about “leaning back,” which is the idea that when a woman starts to think about how to fit a child into her life, is oftentimes the time when she starts to think about leaving her job. Instead, she advises working women to keep their foot on the gas pedal until the day you leave for maternity leave. It’s tempting to become complacent in your job, but that’s not an option when you become a mom. As a parent, you have to do the hard stuff, you have to figure out a solution with what you have and you challenge yourself in new ways. Building that muscle has helped me in my career as much as it’s helped me be a good parent. Absolutely. When I first became a mother, I was leading HubSpot’s global operations team and had to think in data, processes, and project management. To this day as SVP of Customer Success, I still have to think about the million moving pieces and be able to strategically juggle, plan and communicate. That air traffic controller mentality can be said for being a parent as well. Being a working mother, you have to work in time boxes and you have to prioritize the most out of your time. If that means working from 9AM — 3PM so that you can pick your kids up from school, that means those set hours need to be productive and meaningful. You learn to focus your limited time on the things that are most important for your team and for the business and I’ve found that I’ve been even more successful in my career and doing my job well since becoming a parent. I’m fortunate to work at a company that values flexibility. We have unlimited vacation and flexible work schedules that allow me to work from home when I need to and spend time with my family. That being said, there’s no such thing as balancing it all perfectly. As parents, we can’t put pressure on ourselves to choose being a perfect mom or perfect worker. The reality is that there is no perfect and you shouldn’t have to jeopardize one or the other. Another challenge is the concept of mental load which can often weigh down parents. Managing a child is a part time job and even if you split drop off from school with your partner, there are a million other things that one has to think of — setting up the doctor appointments, playdates, camps, etc. The unspoken mental load often falls on the mother and it’s really important that partners own some of that load. My husband is also an executive at a tech company, so we both work hard to balance not only the daily duties of raising good humans, but the mental load that also comes with that. I clearly remember that day I went into labor 7 weeks early with my son. I was supposed to go to a pricing meeting and my maternity leave plan was completely disrupted within minutes. We spent weeks in the intensive care unit and I feel grateful that HubSpot made it easy for us to focus on just him. Coming back from maternity leave, you think that you’ve missed so much, but the reality is that as long as four months feels, there’s a lot that you actually didn’t miss and you quickly come back into your routine. The other memory that clearly stands out in the first few weeks of parenting was the first-time mothers group I was a part of. The moms in that group helped me survive and get through those early and very sleepless weeks of motherhood. And, they are now some of my closest friends. We love to travel as a family and vacations are really important to us. Whether that’s just a long weekend or a longer trip, my husband and I both try to be completely unplugged from work, email, social, etc. and just cherish the time with our kids. There’s a phrase some of our leaders here use at HubSpot, which is the notion of “leaving loudly” and telling your team and colleagues when you plan to be unavailable, offline, or traveling so that not only are we transparent about our schedules, but also set an example for our teams that taking time to relax and recharge is really important to your success at work. Another tradition is bedtime. I’ve learned I can’t say yes to every after-work activity and my husband and I balance our schedules so that at least one of us is always home for bedtime. Surround yourself with a team that you rely on — both at work and at home. I find myself able to more easily switch on and off because of my strong team at work that I know I can trust and rely on. Similarly, when I am at work, I am fully present because I have my full trust in our nanny and don’t have to worry about my kids. Create patterns in your schedule. I leave work at 5:30PM every day and I mostly don’t check my email from 6PM to 8PM during the week or on weekend mornings. Building that schedule was easy thanks to HubSpot’s flexibility, but getting used to being unavailable was a bit harder. Once I got into a routine, it became more natural and I found that if I respected my boundaries, my colleagues did too. Self-care is critical in order to be a functioning and happy, present mother. That includes sleep, working out and eating healthy for me and being able to identify what recharges and fuels me has made a world of difference in actually making those things happen. For us, it’s important we expose them to as much as much as possible to that we teach them to be curious people. We read a lot of books about a lot of different things, we travel to introduce them to new cultures and people and languages, and we encourage them to try new activities such as a new sport so that they understand the importance of being open-minded and turn into lifelong learners. There are quite a few! I’m lucky enough to have access to a community of parents at work who are a part of ParentSpot, HubSpot’s employee resource group. It’s a shared space for all things parenting while working at HubSpot — from resources to programming to benefits, to discussion on the absurdities of parenting. They’ve really helped me to be a better parent. I also have a text chain with 13 of my girlfriends from college who all have kids. It’s great to have a support system that not only knows you from your pre-kid days, but who undoubtedly have gone through a similar experience you may going through. The Longest Shortest Time podcast is one that I really relate to because when you’re in early parenting you feel as if it is the longest time of your life, but in reality the years just fly by. Tinyhood is another great resource and they’ve revolutionized the way arents gain instant access to information and advice through on-demand online courses. Babywise, the nighttime sleeping book was also pretty life changing for us. One thing I always say to my kids is “I love you so much.” I’ve said it so much that it was actually one of the first sentences that both of my children have said. I want my kids to be loved and to love others, so I keep it simple with this phrase. As a mother, there is a quote by Maria Shriver that has always resonated with me. It’s on the wall in our Mother’s Room at work where I’ve spent hours pumping as a new mom and I remember just staring at it and nodding. It goes “having kids — the responsibility of rearing good, kind, ethical, responsible human beings — is the biggest job anyone can embark on.” You oftentimes can feel overwhelmed as a mother and in your career and trying to juggle it all and this simple quote just always resonated with me that the end goal is to raise just kind, ethical human beings that know they are loved. Set your own expectations and stay true to yourself. You can listen to the advice of family, friends, podcasts and blogs, but you have to be true to yourself and what works for your own family. Focus on raising responsible kids and surround yourself with the people who can support your mission. Make sure you don’t forget about what makes you happy. If your job keeps you engaged and motivated, great! If it doesn’t, it’s not worth it. You don’t have to choose either your career or motherhood, but you should make sure that both bring you joy. Last, but certainly not least, make sure your kids always feel loved. That’s all that matters in the end. Thank you so much for sharing these inspirational thoughts with us!